1. Using the Main Dropdown go to Settings. 2. Click the Integrations tab. 3. Find HubSpot in the list of integrations and click the blue Integrate button. 4. If you have more than one HubSpot account or have not logged in to HubSpot already, a window will pop up where you can log in and select your HubSpot account. ⚠️ Note: By default, all new form submissions will be sent to HubSpot to create or update Contacts in your account. To stop a page from sending all form submissions to HubSpot disable the integration for that page. 1. Create a static list in HubSpot. 2. Log in to Landing Lion. 3. Go to the page settings by clicking on your page. 4. Click on the "Integrations" tab. 5. Find HubSpot in the list of integrations and turn the toggle button to active. 6. Add a list by clicking or typing the name of the list in the input field. ⚠️Note: Only static lists can be used when assigning a HubSpot List to a page. Now all contacts from form submissions on this page will be added to the HubSpot List(s) you selected. 1. Create a HubSpot Workflow. 3. Go to the page details by clicking on your page. 4. 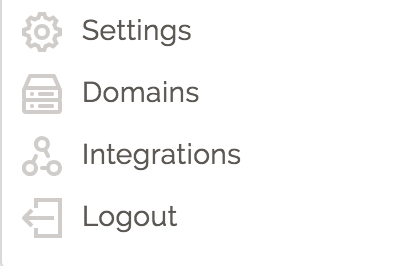 Click on the "Integrations" tab at the top of the page - in the Main Header. 5. Find HubSpot in the list of integrations. 6. Add a workflow by clicking or typing the name of the list in the input field. ⚠️ Note: Your HubSpot Workflow must have at least one action or it will not show up in the list of workflows. Now all contacts from form submissions on this page will be added to the HubSpot Workflow(s) you selected. By default, only email and name fields are sent to HubSpot. Map form fields from your page to Contact Properties in HubSpot to add more Contact data. 1. Create a Contact Property in HubSpot. 2. Under Client Settings click Integrations. 3. Find HubSpot in the list of Integrations. 4. Click "Map Form Fields". 5. Create form field mappings for HubSpot. ⚠️ Note: Be sure to match the form field type in HubSpot to the form field type in Landing Lion. For example, if you are trying to map a single-line custom form field in Landing Lion to a single-line form field in HubSpot, and the same for multi-line form fields.